The United States Mint issues a one ounce .9995 platinum proof coin annually as part of its popular American Eagle Program. 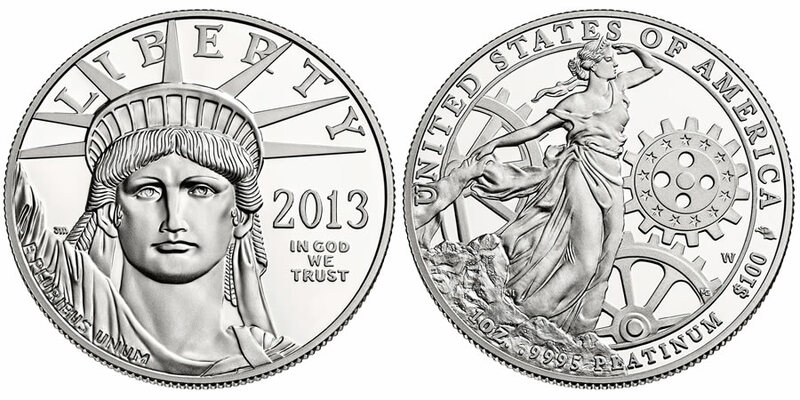 The 2013 American Eagle Platinum Proof Coin continues that tradition which dates back to 1997. In addition, the 2013 Platinum Eagle also is offered as the fifth year of a six year series of coins featuring reverse designs emblematic of the principles found in the Preamble of the Constitution of the United States. The 2013 coin depicts a reverse emblematic of the theme "To Promote General Welfare." The themes are taken from a collection of narratives prepared by the Chief Justice of the United States Supreme Court as requested by officials of the US Mint. Platinum Eagles were also struck in fractional sizes in previous years. However, that practice was discontinued in 2008 as part of a product streamlining process of the Mint. US Mint Sculptor / Engraver John Mercanti designed the obverse of the coin which has remained the same since the series introduction in 1997. It depicts an image of the Statue of Liberty looking "towards the future." Obverse inscriptions include LIBERTY, E PLURIBUS UNUM and the year of production. The reverse of the coin contains the design emblematic of the fifth principle found in the US Constitution, "To Promote General Welfare." Reverse inscriptions include UNITED STATES OF AMERICA, 1 OZ, .9995 PLATINUM and the legal tender face value of $100.